Clos de la Torre extra virgin olive oil, produced by the company Oleícola de l’Empordà, located in Rabós d’Empordà (l’Alt Empordà) has just won Prestige Gold. This is one of the highest awards given in the TerraOlivo 2014 international competition held in Jerusalem (Israel), and places the Clos de la Torre oil among the best in the world for the fourth year running. 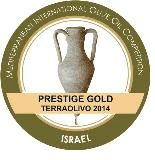 This very high quality, fruity, well-balanced olive oil won the award at the TerraOlivo Congress that took place in June in the Hotel Crowe Plaza in Jerusalem, with the participation of over 400 producers from around the world. The main aims of this international competition include awarding the best virgin olive oils in the world; promoting the nutritional benefits of olive oil consumption; educating about the advantages of an appropriate Mediterranean diet; and presenting all of the award-wining oils to potential importers from international markets and to the media for publicity. According to the manager of Clos de la Torre, Martí Clos: “It is very difficult to win awards and for so many years running, which means we’re doing things right”. He added: “These awards help us to build a reputation and to gain ground in international markets, and encourage us to continue to do our job well”.